Now, we never said smartphones were good for your relationships. So as a quick word of warning before we tell you about this app: we’re not taking responsibility for its consequences. 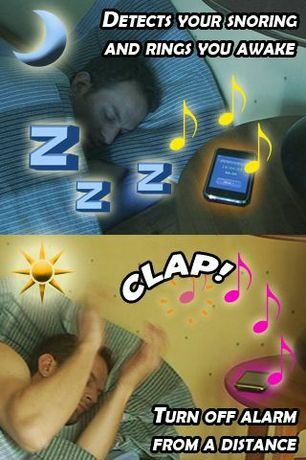 If you’re not the snorer, this app may be good – you’re already woken up by the snoring so you don’t mind the alarm, you have concrete machine-verified proof that your partner was snoring and they’re woken too, forcing them to stop the afore-mentioned snoring. A win situation for you. If you are the snorer I imagine you’ll be pretty damn pissed off at being woken up at all times of the night and you’ll have your defence of “what?! I don’t snore!” stripped away from you. You may not be in a good mood when this thing goes off at 3.40am. Though, that’s only one setting and you can also use it to record when you snore and then pick it up a little analysis of your sleep pattern in the morning recording the times you snored and how long for. In the interests of investigative journalism I just downloaded this and spent several minutes making snorting and heavy breathing sounds into my iPhone. And the answer is yes, it sure does work. It actually picks any sound including singing and talking, so if you talk in your sleep this will pick you on that too. Initially I found the options a little tricky to navigate (wasted about a minute of snoring sounds because I hadn’t turned the alarm on) but after you’ve figured out the set-up, it’s quite straighforward. Well, we’re not recommending it, we’re just saying it’s out there. I ended up using a simple mouthpiece off of amazon. That did the trick for me. Go figure.